Khorosho Productions: The Statuesque Miniatures Social Media Extravaganza! The Statuesque Miniatures Social Media Extravaganza! 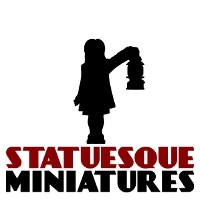 Statuesque Miniatures is two years old today! I have a lot of exciting things planned for 2013, our third year - more releases, expanded ranges, new genres and maybe even some male miniatures! As such, I want to be able to reach as many people as possible to show them all these exciting things as they happen. We already have a Facebook page, the Khorosho Productions blog and a Twitter account but I want MORE followers! So how about a prize draw? Or three? When the Facebook page, Twitter account and Khorosho Productions blog reach 1000 Likes and 500 Followers respectively, I will hold a prize draw including all the names on each list! Three prize draws with a total prize pot of over £165. Full details can be seen HERE. So spread the word, come and see what Statuesque Miniatures has to offer and maybe win some goodies!